At the end of last week I was excited to receive my copy of the new Sport Diving Magazine from Australia. 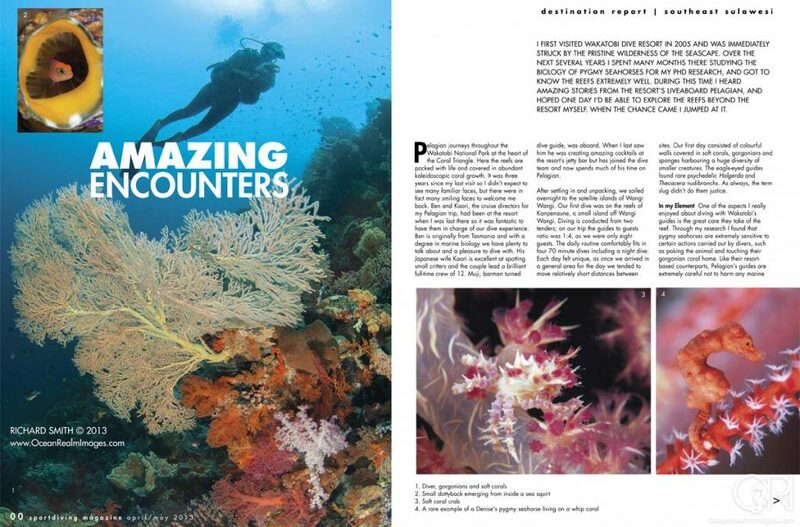 It contains my article ‘Amazing Encounters’ about my trip aboard Wakatobi Dive Resort’s live aboard the Pelagian (available as a pdf download below). I visited the resort in September last year, following a two and a half year gap since I was there conducting research for my PhD on the biology and conservation of pygmy seahorses. It was fantastic to catch up with old friends and have the opportunity to dive the stunning reefs again. I had been truly lucky to have this as my home for six months! On receipt of my copy of the magazine, I was also very pleased to see that I have the cover shot this issue, with a shot I took whilst on the trip. The shot is of a tiny Xenia coral crab, which was so small it would have comfortably fit on a five pence coin! I found the crab on a night dive and it had just moulted its hard exoskeleton, which like all crustaceans they do in order to grow. The hard external shell prevents day-to-day growth, so growth occurs in bouts immediately after shedding of the old skin. Whilst the new skin is soft and malleable, the crab pumps up its body slightly, like a balloon, and stretching it before it hardens. For more images from the trip, please feel free to browse my images by following this link.